Anaerobic ammonium oxidizing (anammox) bacteria present in microbial communities in two laboratory-scale upflow anoxic reactors supplied with small amounts of ammonium (<3 mg/l) at low temperature were detected and quantified. The reactors, operated at 20°C, were seeded with an immobilized microbial consortium (IMC) and anaerobic granules (AG) from an upflow anaerobic sludge blanket (UASB) treating brewery wastewater. 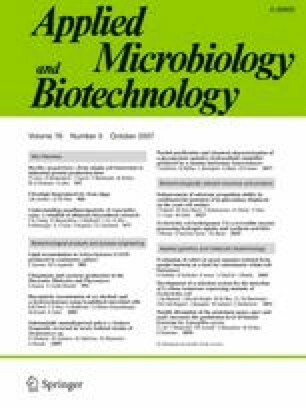 Our results showed that complete ammonium and nitrite removal with greater than 92% total nitrogen removal efficiency was achieved in the reactor inoculated with both the IMC and AG, while that of the reactor inoculated with only the IMC was lower than 40%; enrichment was successful after the addition of AG. Quantitative fluorescence in situ hybridization (FISH) analysis confirmed that anammox bacteria were present only in the reactor inoculated with an IMC and AG. The copy number of the 16S-rRNA gene of the anammox bacteria calculated by most probable number-polymerase chain reaction (MPN-PCR) from the total DNA extracted from both reactors (2.5 × 104 copies/μg of DNA) was two orders lower than that of the domain bacteria (2.5 × 106 copies/μg of DNA). The results revealed that immobilized multiple seed sludges were optimal for anammox enrichment at low temperature and ammonium concentrations. The authors would like to acknowledge the University of Yamanashi, 21st Century Center of Excellence, for providing financial support and thank Saiki Yuko and Yukiko Hiraga for providing technical help during the experiments. Further, we thank Deb P. Jaisi for his help during the preparation of this manuscript.